The concept behind night covers is to create a thermal barrier that deflects ambient heat and light away from the refrigerated case while allowing cool air to circulate inside the case. Refrigeration systems that remain open expel more energy in an effort to move the warm air that infiltrates the case, into it’s internal system where it must cool it before it can circulate throughout the case. Night covers help to keep the warm air at bay so that only the already cold air can circulate. 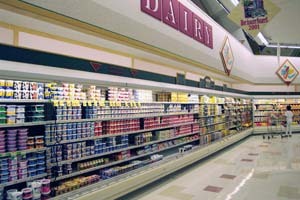 Refrigeration shades help to manage operating costs and expenses associated with commercial grocery store refrigeration systems. But night covers also do more than that. They save money and time too! Installing ECONOFROST thermal blinds on multi-deck and merchandiser cases helps protect perishable foods from premature wilt and spoilage. Shrink and discard rates drop as foods last longer; staff spend less time maintaining and trimming displays. With less pulled and discarded product your business is able to sell more, reduce waste and the limit the costs associated with merchandising fresh foods.